Randy Wiles was the pitcher the Cardinals traded to acquire Tony La Russa. In a deal made with the intention of jump-starting a pair of stalled minor-league careers, the Cardinals sent Wiles to the White Sox in exchange for La Russa on Dec. 15, 1976. From there, the careers of the two players took different paths. La Russa played one season as an infielder in the Cardinals system before beginning a long and successful second career as a manager, including 16 years (1996-2011) with St. Louis. His two World Series titles, three National League pennants and a franchise-leading 1,408 wins with the Cardinals helped get him elected to the National Baseball Hall of Fame. Wiles, a left-hander, pitched briefly with the White Sox in 1977, got traded back to the Cardinals after the season and was out of baseball by the end of 1978. His death on Sept. 15, 2015, at age 64 prompted me to research his story and tell it here. Randy Wiles was selected by the Cardinals in the fifth round of the 1973 draft after earning all-Southeastern Conference honors at Louisiana State University. He was drafted just ahead of another pitcher, LaMarr Hoyt, who went on to become a big-league all-star. In his first two seasons in the Cardinals’ system, Wiles established himself as a prospect with big-league potential. He spent 1973 with the Gulf Coast Cardinals (managed by Ken Boyer) and Class A St. Petersburg, posting a 2.81 ERA in 16 games. In 1974, Wiles had one of the best seasons of any pitcher in the Cardinals organization, with eight wins and a 2.56 ERA in 30 games at Class AA Arkansas. Wiles won seven of his last eight decisions, yielding two runs for the month of August. Wiles opened the 1975 season at Class AAA Tulsa, playing again for Boyer. Instead of positioning himself for a promotion to the big leagues, Wiles took a step back, posting a 5.92 ERA in 11 games. “I was so inconsistent … I couldn’t keep the ball down,” said Wiles. The Cardinals demoted him to Arkansas. Dejected, Wiles was 4-5 with a 3.45 ERA in 12 games for the Class AA club. Instead, the Cardinals sent Wiles to Arkansas. The Cardinals had signed a batch of former big-league pitchers _ Lloyd Allen, Roric Harrison, Lerrin LaGrow and Harry Parker _ and assigned them to Tulsa, leaving no spots available for Wiles. 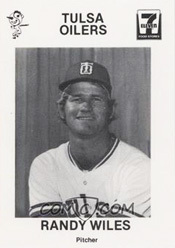 Wiles did get promoted to Tulsa during the 1976 season and, reunited with Boyer, had a 3.90 ERA in 12 games. After the season, his fourth in the Cardinals system, Wiles, 25, was traded to the White Sox for La Russa, who had batted .259 at Class AAA Iowa in 1976. La Russa, 32, no longer was considered a big-league prospect, but he appealed to the Cardinals as a player-coach who could mentor infielders such as Jim Riggleman and Ken Oberkfell at Class AAA New Orleans. The White Sox sent Wiles to Iowa for the 1977 season. In August, seeking a left-handed reliever, the White Sox promoted Wiles to the big leagues. Wiles appeared in five games for Chicago, with a 1-1 record and 10.12 ERA. After two weeks with the White Sox, Wiles was placed on waivers and claimed by the Cardinals, who sent him to join La Russa in New Orleans. After the season, the Cardinals traded Wiles again _ to the Astros for minor-league pitcher Ron Selak, a former Cardinals prospect who had been selected by St. Louis three rounds ahead of Wiles in the 1973 draft. Meanwhile, the Cardinals talked with La Russa about becoming manager of their rookie league club at Johnson City, Tenn. Though flattered, La Russa said he’d rather seek a position at a higher level of the minor leagues. In 1978, Wiles, 27, pitched his final season of professional baseball, with the Astros’ Class AAA club in Charleston, W.Va. La Russa launched his career as a manager that season, with the Class AA Knoxville affiliate of the White Sox. A year later, La Russa, 34, became White Sox manager.